5 Ronin #1 - 5 (2011) VARIANTS!! DEADPOOL HTF PSYLOCKE Marvel VF/NM LOW RUN! 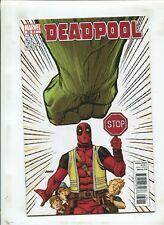 Deadpool #1 - 9 1997 + 1-17 2011 Series Vol 1 and 2 Lot of 26 High Grade! This page was last updated: 19-Apr 20:39. Number of bids and bid amounts may be slightly out of date. See each listing for international shipping options and costs.